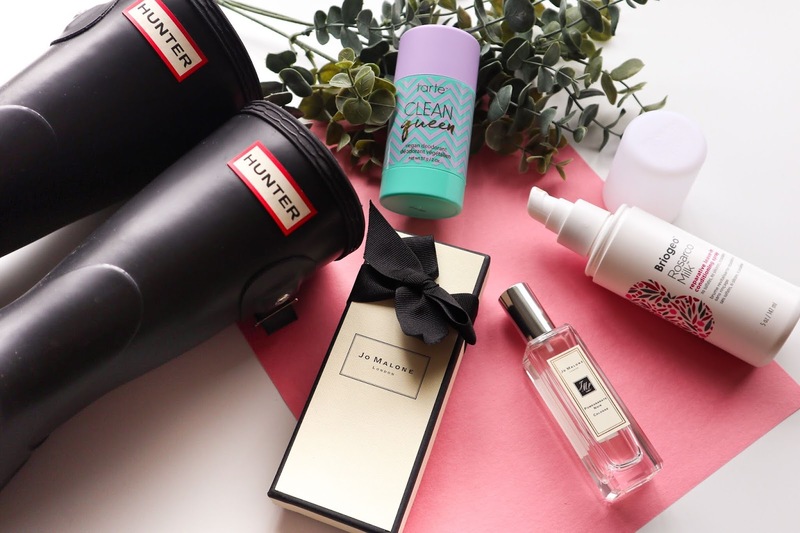 Today I am going to be sharing with you my updated morning skin care routine. I was planning on having my morning and night time routines combined into one post but that would have been a really long post. By splitting them into two different posts it will allow me to really get into details on some of the products that I will be sharing. It was last summer in August that I shared my at the time current skin care routine and since then a few things have changed. I have added some new items to my routine along with removing some others. I feel like my skin is at its best right now besides a few days out of the month when my period rolls around, just like every girl out there I get a couple break outs here and there. All the products that I am currently using I feel has been working wonders on my skin. I'm always sharing with my friends the products that I'm loving and that have been working well for me. Today I wanted to do the same and share them with all of you. *Quick Disclaimer:* Please keep in mind that I'm not a professional or expert when it comes to skin care. I have learned all these things on my own by doing my research, from experience, and from specialists from whichever stores where I purchased these products. Also I have oily and acne prone skin and most of these products are mainly to help with that. Starting off with the first product(s) I use in the morning, a face cleanser. I've been using two from Lush and I have already spoken about both of them here on a past monthly favorites. These are both face and body cleansers but I only use it for my face. I first was introduced to Dark Angels cleanser back in March then shortly after I picked up Herbalism and I switch between these two every day. I use them both exactly the same, I first wet my face with warm water, always use warm water on your face. Then I grab a small yet generous sized chunk and drip water onto it. You don't want to use too much water and you don't want the product to become very runny. You will want the consistency to be paste like, then I rub it onto my face in circular motion. Rinse and pat dry. 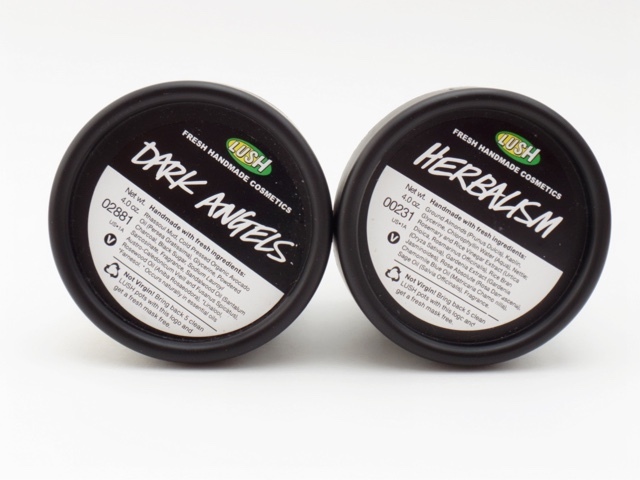 Dark Angels cleanser is a black sugar and charcoal cleanser. It gently exfoliates your skin and always leaves my face feeling clean, fresh and super soft. This is great for people with sensitive and oily skin also people who are acne prone. This cleanser is great because it goes deep into the skin and helps prevent breakouts too. I love this stuff, I am almost out of it and I will definitely repurchased it. Rudy even loves using this too. It is also gentle enough for you to use everyday if that is what you choose to do. Herbalism cleanser is also targeted for people who battle oily and acne prone skin. This product is supposed to help balance the oils of your skin but what I love most about this is that when I have a couple of break outs, usually around my jaw and chin, I spend a little more time rubbing the product into my skin and I have noticed that it helps my break outs disappear a lot faster than it used to in the past. At first I was a little unsure about this cleanser because I felt I wasn't seeing any result but I actually do and love it. 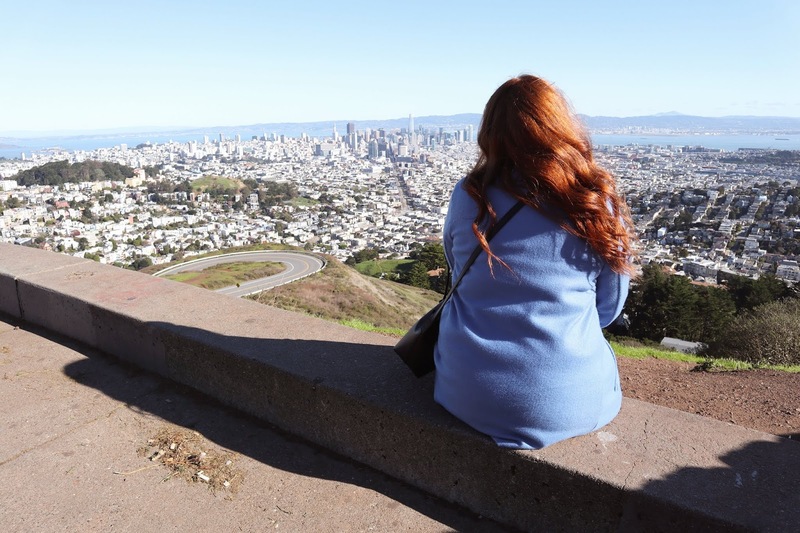 At one point I was battling with a small break out on the side of my neck and once I started to use Herbalism on it I saw a huge difference by the second morning! I love both these product for different reasons as you see, which is why I need to have them both in my morning routine. One day I'll use dark angels and the next herbalism that way I get the effects of both consistently. If I am struggling with a bad break out or pimple that I really want to go away quick I use herbalism two days straight and it helps tremendously. I've already purchased my second pot of it too! 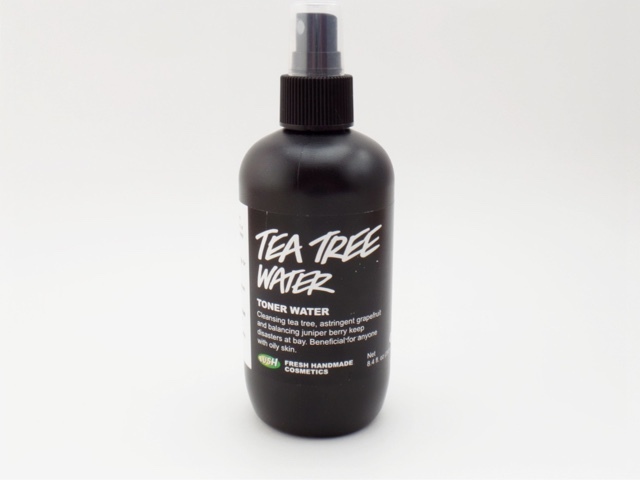 After I pat dry my face I always spray my face with some of my Tea Tree Water Toner. I have also mentioned this toner on a monthly favorite for a good reason. As soon as I spray this over my face I immediately feel refreshed. This water is a toner so it helps with toning your skin along with brightening. Tea tree is also really good for oily skin, it helps clear the excess oils on the skin and it's also really good with reducing redness. 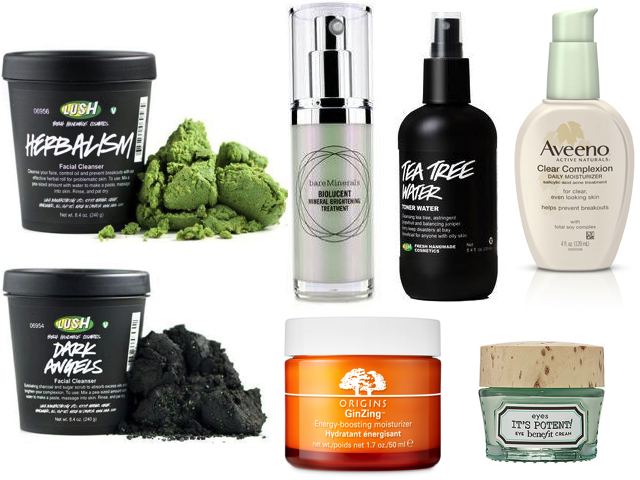 I have noticed a huge difference with my skin since adding all these Lush products into my routine and the oiliness being the number one change. I do still get oily on my T-Zone but it is nothing compared to before and I am very happy these all have been working for me with summer being around the corner. I love that Lush is a cruelty free brand and usually fresh products as ingredients. I am more than happy to use products that are good for my skin. For morning moisturizers I like to switch off with a few different ones every day that why my skin doesn't become accustomed to one. I also mentioned doing this on my skin care routine post from last year. Here are the three moisturizers I have been currently using. Earlier this year I started using this Aveeno Clear Complexion daily moisturizer. I wanted something that would help my skin with its break outs during that time of the month. This moisturizer contains Salicylic Acid which is supposed to help clear up your blemishes along with preventing them. I like this moisturizer because it does exactly that, that doesn't mean you won't never get a pimple again but I have noticed that I get less break outs. It also gives my oily skin the perfect amount of moisture without making me look greasy. This product does not contain any SPF which I wished it did so make sure to put someone before of after your moisturizer. Products that help with blemishes tend to make your skin a lot more sensitive to the sun so try to avoid it as much as possible and always protect your skin. I shared this Origins GinZing Energy Boosting moisturizer on my skin care routine from last year but I realized I didn't say anything about it nor did I mention why I liked it. I LOVE the brand Origins, they really have some of the best skin care products I have ever tried. I also love this moisturizer since the first time I started using it. This moisturizer is supposed to give your skin a healthy vibrant glow. It smells amazing like fresh oranges a scent I really enjoy. 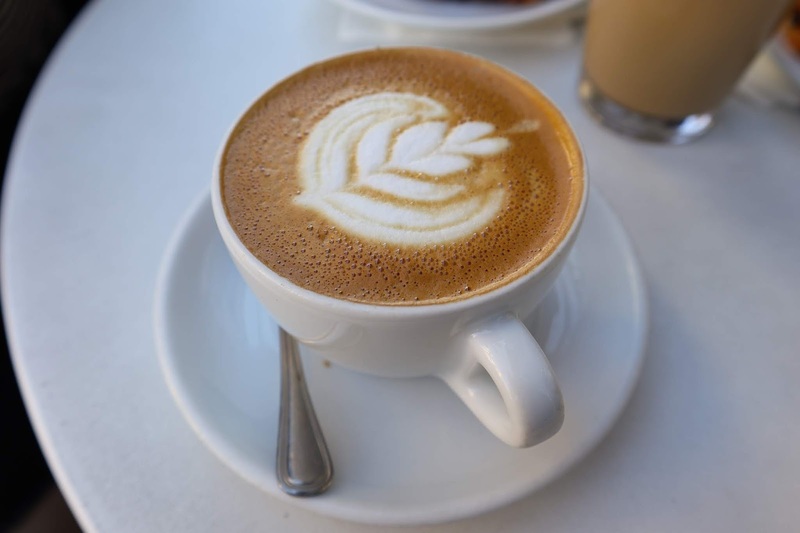 The smell right in the morning is the perfect wake me up. It also hydrates my skin just enough without making my skin feel sticky. A moisturizer that doesn't feel heavy or make me look oily is ideal for me. 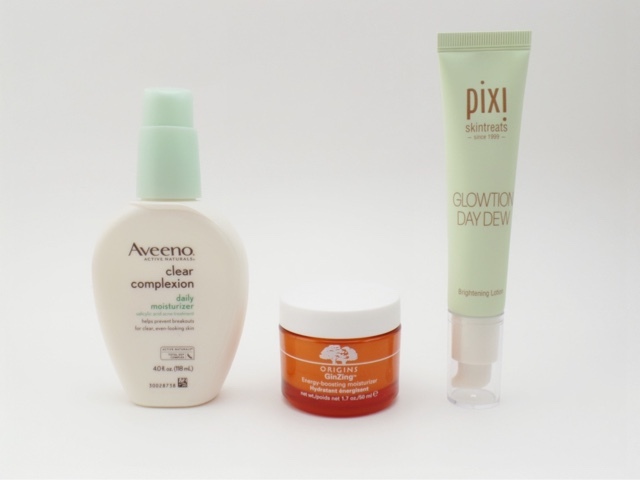 Lastly every couple of days I use the Pixi By Petra Glowtion Day Due, I even shared this in my March Favorites. This product is a lightweight moisturizer that gives a beautiful glow to your skin. It really is a lightweight moisturizer and because it has a radiance to it I was a bit worried on how it would wear on my oily skin. When I wear this I don't find my skin looking extra oily because of it. I love to wear this underneath my makeup because it gives off such a beautiful natural glow without being excessive. It is also said that this moisturizer blurs imperfections too but I never really paid attention to that. 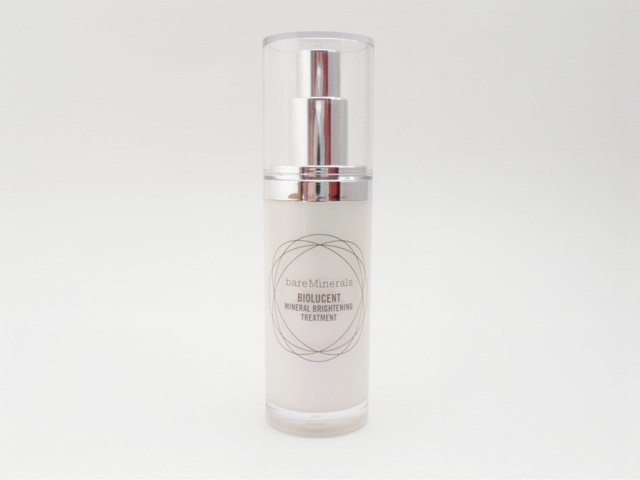 With any moisturizer I use I always use one pump of the Bare Minerals Biolucent. This is a brightening treatment and I have been using this for over a year now. I love this stuff! It has helped my skin so much with making dark spots from blemishes disappear and it gives my skin a gorgeous natural light radiance. I believe its now discontinued, months ago when I was going to reorder this I noticed it was on sale online at Sephora then at one point it was completely gone. Another day while I was browsing through their sale items I saw it was back in stock so I made sure to order a few back ups and now it's no longer on their website. Bare Minerals did come out with a new skin care line of products and I know they suggest that if you loved this Biolucent treatment to try out their new Skinlogevity. I'm thinking this is probably a new version of the Biolucent treatment with new improvements and maybe other benefits. I may give this product a try once I am out of my back ups. I am still upset that they discontinued it. For the final step of my morning routine I apply some eye cream. I have been switching between these two along with sample ones I receive from Sephora when I do an online order. 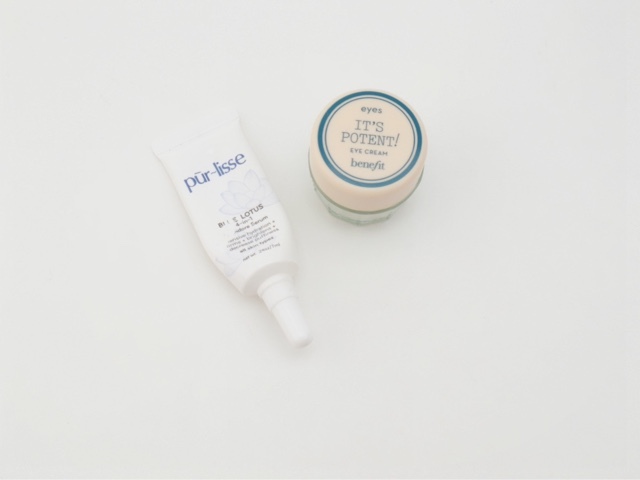 I received the Pūr-lisse one in a Ipsy bag a few months back and I've enjoyed it. It isn't very thick and it absorbs into my skin very quickly which I really appreciate. I don't know if I have noticed any difference with using it. I usually use this eye cream at night but sometimes I do use it in the mornings. The other eye cream I use is the Benefit it's potent eye cream and I have owned it for quite some time now. This cream I usually use in the mornings. I am almost out of both these eye creams and I am looking to try some new ones. I'm not sure which brand owns the best eye cream so if you have a favorite one please let me know on the comments below I would really appreciate it. I have a brand new eye cream from Origins that I received apart of a box set along with other items and I will probably begin using it soon. I used it in the past and enjoyed but once again it's another eye cream that I don't know if I really saw any results while using it. This is the end of my morning skin care routine, pretty quick and simple. I really hope this helps at least one of you out. I will be back next week with my night time routine and there is a few more extra steps compared to my morning routine. I love these types of videos too. You should make a video on your morning and night time routines. I miss your videos. That was actually something I was thinking about. I have been meaning to make some videos but I'm still waiting for some things I need to come in the mail. Hopefully I can make videos soon, any suggestions to what you'd like to see? I loved your morning skin care routine, now if only I make sometime to also include a morning skin care routine in my life. Thank you. Haha yeah you do even if its quick and simple. I'm sure you will see a difference that it makes.